Our video of "It's 4:20 Somewhere" is today's Mental Health Break on The Dish, the blog of the indispensable Andrew Sullivan. We have long been huge fans of Sullivan, who courageously fights for both civil rights, as well as the legalization of cannabis. Roger McNamee Announces Duo With Jason Crosby - Doobie Decibel System!!! 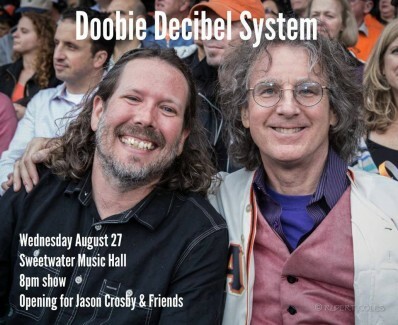 Roger McNamee is pleased to announce that he and Jason Crosby have formed a duo called "Doobie Decibel System!!!" They played their first show on Wed. August 27 at the Sweetwater Music Hall. 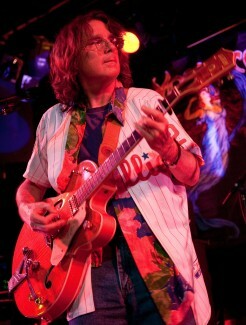 (You can watch it at http://www.moonalice.com/tour/2014-08-27/jason-crosby-friends-sweetwater). On September 1, KWMR in Bolinas interviewed Roger about all things Moonalice. The 30 minute conversation starts at the 57 minute mark. Enjoy! 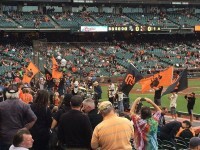 Moonalice played at Jerry Garcia Night at AT&T Park, just before the start of the game between the Giants and White Sox. We played a set in Triples Alley, followed by three songs on top of the visitors' dugout. The video includes shots of the dugout set. From Small Regional Band To National Touring Act – For Moonalice, Facebook Was The Key!!! 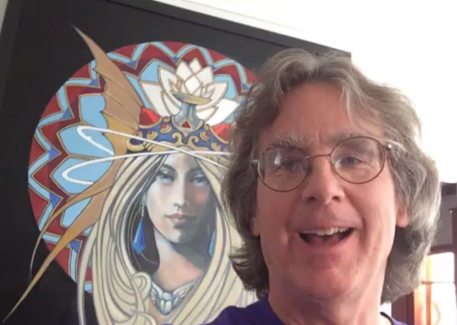 Roger McNamee - From small regional band to national touring act - Facebook was the key! According to Moonalice legend, Moonalice received a great mention in the SF Weekly Blog on what to do on the 4/20 Easter weekend in the Bay area! "If you want to celebrate both holidays simultaneously, head to Slim's for an all-ages event featuring live music by local psychedelic rock band Moonalice and an Easter egg hunt (one of the prizes is a pair of tickets to BottleRock). The band will have several friends with them, including Wavy Gravy. Doors open at 4 p.m., the music starts at 4:20 p.m., and tickets to the event are, we kid you not, exactly four dollars and 20 cents." 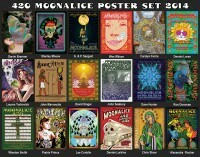 18 Mind Blowing Posters In Moonalice 2014 4/20 Poster Set!!! 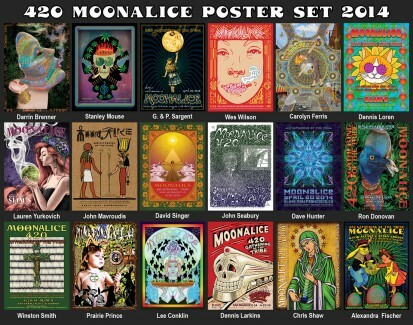 According to Moonalice legend, each attendee at the 4/20 show at Slim's will receive a set of 18 posters as a gift from the band! Each poster is amazing and unique in its own right, together they make for a mind blowing collection of the very best of rock poster art! 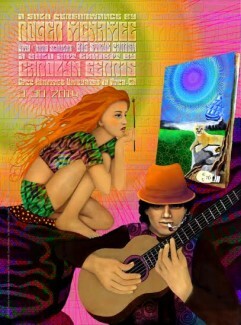 There will also be an exhibit of the all 696 posters in the Moonalice series. Following their performance at the BottleRock Napa Fesival on 9 May last year, Moonalice will be returning for two performances at this year's festival, on Friday 30 and Saturday 31 May, joining the 45 artists that have so far been confirmed and announced. “Internationally celebrated artists The Cure, Outkast and Eric Church will headline BottleRock Napa Valley this spring creating an incredibly diverse lineup of talent that puts Napa Valley on the world-wide music map,” said David Graham of L38, the organizers of this year's event. A Sunday art and music series starts at high noon on March 30 at the Capp Heritage Vineyards Tasting Room and Vintage d’ Elegance Lounge in Napa, with artist Carolyn Ferris presenting original paintings and Moonalice singer/songwriter Roger McNamee performing original songs from 3pm to 5pm. Everyone attending the 30 March show will receive a free poster created by Carolyn to mark the event. Steve Parish, Road Scholar to Moonalice and confidant of Jerry Garcia will be present to add his special brand of humor during Roger's solo performance. 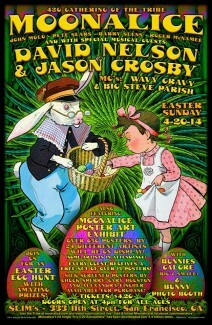 Moonalice 4/20 Celebration with Special Guest David Nelson!!! According to Moonalice legend, this year's 4/20 celebration at Slim's in San Francisco will be even more special than usual!!! David Nelson will not just be sitting in - he and Big Steve Parish will interview each other in one of the set breaks!!! Doors will be at 4:00pm PT, show time at 4:20pm. 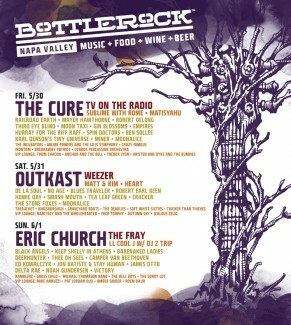 Admission is $4.20 for general entrance, with dinner tickets at $29.15. More information at Slim's: http://www.slimspresents.com/events/2014-04-20/moonalice-3/.